From distribution of digitized content to social media, blogs, news sites and print media -- to digital delivery of video & audio to television & radio newsrooms, our long-standing relationships with news outlets translate into outstanding results for our clients. Our mediablast service delivers content to internet, television, radio and print media simultaneously, providing maximum reach for a minimal investment. Hosted by newscast on a client-branded webpage with a unique URL, the mediablast multimedia release doesn’t bog down client networks with its resource-intensive assets. Archived for one year, mediablast releases are customized, and can include photographs, logos, text, video, audio, and links to other websites. mediablast also provides embed codes so that media, bloggers and social networkers can post your video directly on their websites and pages. Bookmarking and sharing options with dozens of social media sites such as Twitter, Facebook, Newsvine, Digg, and LinkedIn, as well as custom distribution options launch your story in cyberspace, and beyond. Prevacid 24HR launch for Novartis. 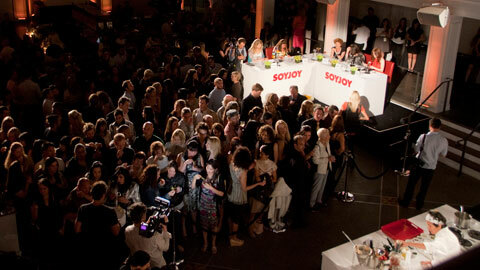 SOYJOY Battle of the Chefs:Eco-Cuisine. N.E.D. No Evidence of Disease. Six rocking cancer doctors.